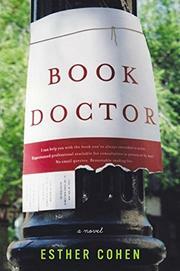 Book doctor Arlette seeks to create a book—and a life—of her own. Years ago, Arlette fell backwards into the fixer business when an editor friend asked her to take a look at an unwieldy manuscript. Now, at 35, she has a career she never quite meant to have. In addition, she’s in a relationship that doesn’t seem to be going anywhere. In some ways, Jake is perfect for her. Another artistic type, he organizes movie festivals for Film Focus, a New York City art-movie house. He wears only black, and he special-orders black pencils from Europe. Enter Harbinger Singh, an accountant who needs Arlette to help him write a novel in order to win back his estranged wife, Carla. In Singh’s novel-to-be, the hero is devastatingly attractive to a woman named Marla. Something about Singh—his willingness to try new things, his tendency to sing songs as he walks down the street—shakes Arlette’s complacency, and she begins a campaign to fix her relationship with Jake and to write a book of her own. Cohen has assembled a collection of lovely moments and pithy observations, including the charming monologues of Arlette’s grandmother and the description of Jake’s taste in film. She has set herself a particular challenge, however, in making her protagonist a book doctor who tightens the work of others. Her plot herks and jerks; characters speechify in long paragraphs; and Singh, her catalyst for change, at times gets dangerously close to being a collection of amusing tics. The author has been unable to resist throwing in countless letters from readers seeking Arlette’s help. They’re entertaining, but they stop the action in its tracks. Arlette herself observes that it’s “easier to criticize people who were trying than to write herself,” but doesn’t save Cohen’s novel from failing to become more than the sum of its parts.